1924-25, Henry Lion. San Vicente at Crescent Heights and McCarthy Vista. Foundry: Roma Bronze Works, New York. The plaque states: This fountain is a memorial to the gallant pioneers of '49 of who Daniel O. McCarthy, patriot, miner, leader, was an outstanding example. He was born Raleigh, N. C. August 24, 1830. Died Los Angeles August 13, 1919. 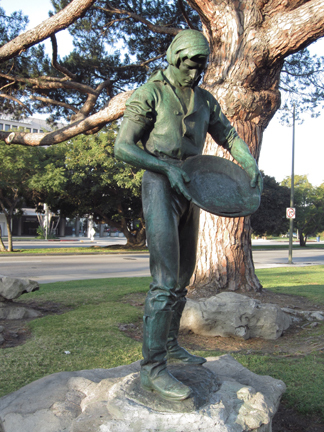 Through his newspaper "The American Flat" San Francisco, he helped preserve California to the Union. This long, useful life is a heritage of which the Golden State is justly proud. Dedicated by Ramona Parlor 109 NSGW (Native Sons of the Golden West). Financed by the Ramona Parlor of the NWGW and Harvey McCarthy of the Carthay Circle Holding Company. The photograph to the right is from the SOS! 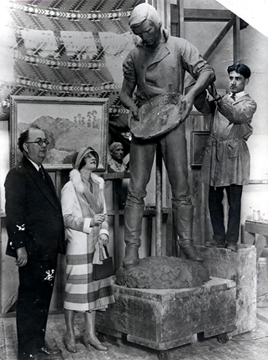 Los Angeles sculptures file, which in turn drew on the Historic photographs collection of the Los Angeles Public Library. 1926, Henry Lion. San Vicente at Crescent Heights and McCarthy Vista. Dedication plaque: This monument suggested by Miss Eudora Caroutte of Sacramento, California. 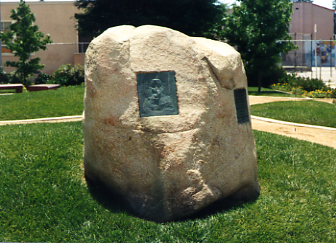 Dedicated by the Native Sons of the Golden West. Assisted by the Historical Society of Southern California. Erected by the Founders of Carthay Center 1926. 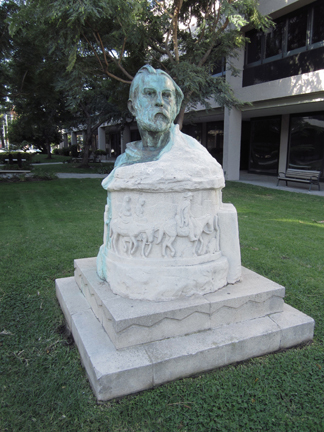 Text from the sculpture plaque: Juan Bautista de Anza. Soldier, explorer and discoverer of the overland route from Sonora Mexico to California. Leader of the first Spanish settlers who came through San Carlos Pass December 1775 (?) on the way to Monterrey. Done for love of California. Dedicated by the Native Sons of the Golden West and the Los Angeles Historical Society, 1929.